Our financing puts your business plans into motion. Get the business financing you need today. We are an equipment financing company offering solutions for virtually any business need. You need cash-in-hand to make your next business move, and you need it fast. With Ascentium, a simple one-page application could get you approved for up to $250,000 in as little as two hours. Don't let the cost of equipment acquisition keep you from seizing opportunities. We offer financing up to $1.5 million on equipment & technology with low to no upfront costs and extended term lengths. Ascentium's customized financing offerings for specialized markets. News and information from the experts at Ascentium. Ascentium Capital LLC, an award-winning equipment finance company, announced the execution of a $375 million small ticket equipment securitization of Ascentium Equipment Receivables Series 2019‐1. Ascentium Capital LLC, a leading national commercial lender, experienced a strong first quarter funding $278 million representing 24% YOY growth, the highest origination quarter in the company’s history. Ascentium Capital LLC, an award winning national commercial lender, announced that Craig Colling joined the company to develop new vendor financing programs and expand the organization’s footprint with a new sales office in Arizona. Ascentium Capital LLC, the top private independent finance company in the United States by new business volume, proudly hosted an Academy for Lease and Finance Professionals (ALFP) in Dover, Hew Hampshire. Ascentium Capital LLC, the top private independent finance company in the United States by new business volume, announced surpassing $3 billion in origination volume since the Company’s inception in August 2011. Ascentium Capital LLC issued a $237 million small ticket equipment securitization. Ascentium Equipment Receivables 2017-1 Trust featured a senior-subordinated structure with “Aaa” ratings from Moody’s and Kroll. Ascentium Capital announced significant growth as the company achieved a 44% increase on total assets and a 56% increase in funded volume year over year. Ascentium Capital, a leading national commercial lender, announced that it surpassed $1.5 billion in funded volume since its inception on August 4, 2011. Third quarter also resulted in strong financial performance with a funded volume increase of 48 percent over the same period last year. Ascentium Capital, a leader in providing commercial financing across the United States, announced strong financial results for the quarter ended June 30, 2015, with a record funded volume increase of 51% over the same period last year. Ascentium Capital, a leader in providing equipment financing across the United States, announces its support of Wayne Fueling Systems (“Wayne”), a global provider of fuel dispensing, payment, automation, and control technologies for retail and commercial fuel stations, through its customized finance program. Ascentium Capital, a leader in providing commercial financing across the United States, announced strong growth during first quarter 2015. The company obtained a 77.3% increase in volume over the same period last year and with assets near $743 million, a 69.3% increase was achieved. Ascentium Capital issued a $330 million small ticket equipment securitization of Ascentium Equipment Receivables LLC, Series 2015‐1. This represents the company’s third securitization since 2012. The underwriters on this transaction were Credit Suisse, Bank of America Merrill Lynch, and JP Morgan. Ascentium Capital, a national commercial lender providing comprehensive finance solutions, announced that Moody's Investors Service upgraded the subordinate bonds of Ascentium Equipment Receivables 2014-1 LLC. Ascentium Capital, a national commercial lender providing comprehensive finance solutions, announced that DBRS upgraded Ascentium Equipment Receivables 2012-1 LLC Classes B and C to “AAA (sf)”. Ascentium Capital, a national commercial lender providing comprehensive finance solutions, announces significant growth as the company funded $440,000,000 in transactions during 2014, representing a 57% increase over last year. Ascentium Capital, a leading commercial lender, announced that it surpassed $1 billion in funded volume since its inception on August 4, 2011. The company continues efforts to strategically grow its business and expand its national presence. This sales office will specialize in delivering Ascentium Capital’s flexible lease and working capital loan products directly to small and medium sized businesses across the United States. Ascentium Capital, a leading national commercial lender, celebrates its three year anniversary and surpasses a key milestone by reaching $2 billion in credit applications since its inception. Ascentium Capital, a leader in custom financing programs nationwide, announced record gains during second quarter 2014. Over the same period last year, the company obtained 57% growth in financing volume. Ascentium Capital announced strong growth during first quarter 2014. The company obtained a 35% increase in volume over the same period last year and with assets near $500 million, a 57% increase was also achieved. Moody’s Investors Service and DBRS issued the highest possible ratings, Aaa and AAA respectively, on Ascentium Capital’s senior class of notes in their second securitization which closed today. The underwriters of the transaction were Bank of America, Credit Suisse and JP Morgan Chase Bank. In response to client demand and growth opportunities, Ascentium Capital announces the opening of a second sales office in California. Ascentium Capital announces a 47% increase in volume in 2013 and strategic initiatives planned for 2014 as it deepens and expands its business partnerships. Ascentium Capital celebrates its second year of providing innovative finance solutions and delivering a service-rich offering which has allowed the company to surpass $1 billion in applications since its founding. Ascentium Capital LLC announced today the addition of another financial firm, JP Morgan Chase Bank, to its existing lender group which also includes Bank of America, Credit Suisse and Bank of Montreal/Harris Bank. Ascentium Capital LLC sales volume for the fourth quarter in 2012 increased 323% versus volume in fourth quarter of 2011. Ascentium Capital LLC announced today that it closed its first securitization of equipment finance contracts, Ascentium Equipment Receivables (ACER) 2012-1, on November 27, 2012. This is the first term securitization for the company and comes just 15 months after being capitalized in August 2012. Ascentium Capital LLC announces that it added both Bank of America and Credit Suisse to its existing lender group which currently includes UBS and Bank of Montreal/Harris Bank. Ascentium Capital, a national independent leasing company specializing in small to medium sized business lending, has been recognized by Monitor Magazine, the leading publication in the equipment and finance industry, as one of the top 100 equipment financing and leasing companies in the United States. Ascentium Capital LLC announced the merger of American Equipment Finance and the appointment of Richard A. Baccaro as Executive Vice President of Sales and Marketing and Len Baccaro as Senior Vice President of Sales. Our clients aren't just satisfied, they're delighted. 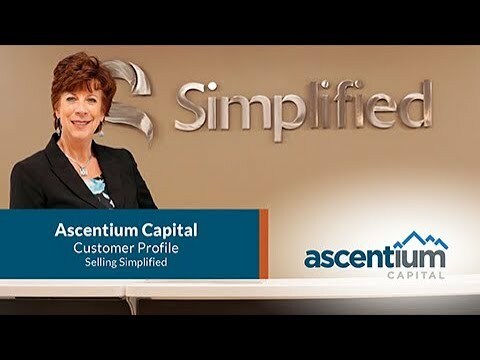 Karen Phillips, CFO of Selling Simplified, explains how Ascentium Capital’s technology financing helped them automate and streamline operations to stay ahead of competition and provide customers with the best data possible. “Two things come to mind when I think about Ascentium Capital. One is the speed with which I can get an answer. The second is the great rate that they give me,” said Phillips. 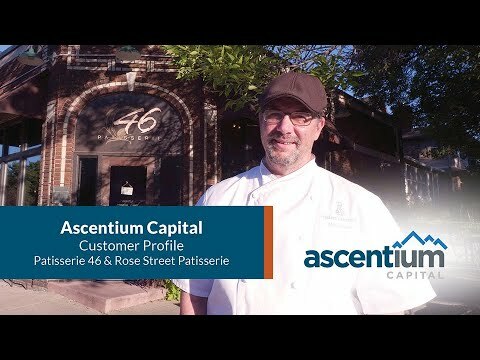 From replacing broken-down equipment to equipping a new commercial kitchen, John Kraus counts on Ascentium Capital to help his French-style bakeries grow: “Every time I’ve turned to them, which is 5 or 6 times over the last 10 years, they’ve always made it happen. And for me, that’s a huge level of respect and trust for a company,” said Kraus. 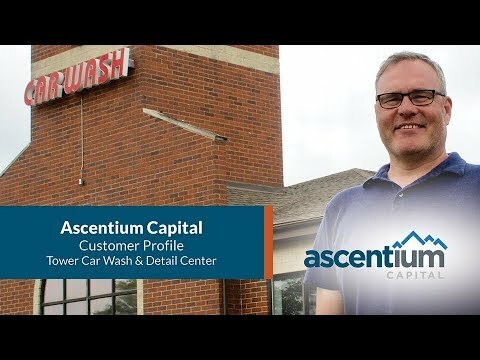 Robert Powell, owner of Tower Car Wash & Detail Center, has financed various upgrades with Ascentium Capital, including POS software and a tunnel control system. Ascentium's prompt and friendly assistance has enabled him to streamline operations and he says the Ascentium team is "easy to work with, easy to talk to, and I was able to get my funding in a quick amount of time." 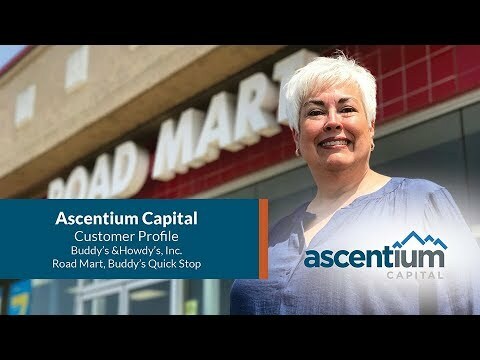 Cindy Turner, owner of 5 convenience stores, shares how she has been able to grow her business with Ascentium Capital’s fast and flexible financing. After financing fuel pumps, cash registers and her latest addition of the Hatch Chili Grill food concept, Cindy proclaims she is “an Ascentium Capital customer for life”. PAVE NORTHWEST, INC. owners explain how their partnership with Ascentium has helped them grow and streamline their small business. After being denied conventional financing, they reached out to Ascentium and completed the quick one-page application and got 100% financing for their excavator, track loader, and pull behind air compressor.